If you prefer organic fruits and vegetables for your family, then have no fear! My Organic Ratatouille Lasagna is 100% organic from the olive oil to the pasta. And the Veggie Wash is organic, too! Y’all know how much I love lasagna. I’ve made it more than I’ve shared it on the blog. I should remedy that. But, in all honesty, I probably make the lazy lasagna more often than any other types of the lasagna. It’s so delicious and so … lazy! I’ve even tried a few that were fails. Well, I thought they were okay, but the hubs said no. I made an all veggie lasagna with a white sauce. That didn’t go over well. Sometimes they’re just watery and not really blog worthy. And then there’s the lasagna ideas I have in my head. 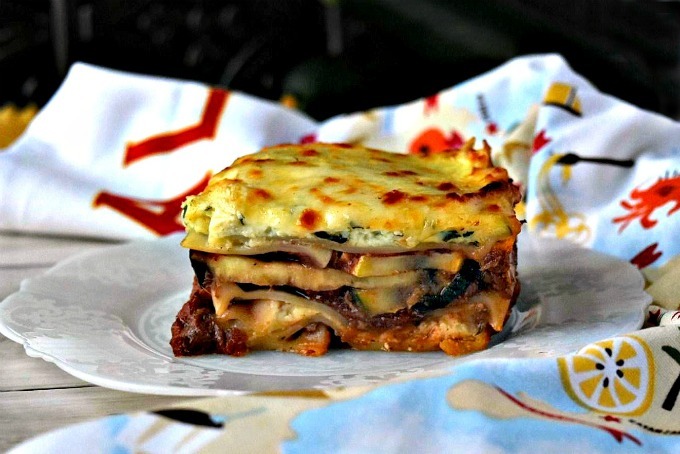 Mushroom lasagna. Pastitisio lasagna. Mexican lasagna. Those are just a few ideas I have for traditional lasagna. Then there’s the non-traditional lasagna recipes. I’ve made lasagna joes that are fabulous! They’re also a super quick meal your kids will love. I know, but my big kid and I loved them. I’m thinking about a stuffed lasagna pepper. Wouldn’t that be delicious? If y’all have been reading my blog, then you know that I’m always up for a challenge. I mean, I made French macarons for the first time by jumping in with both feet. That didn’t turn out too bad, did it? Next was the Kosher Thanksgiving dinner. That was even more of a challenge. Especially since I had no idea how to cook Kosher. Luckily, I knew someone who ate Kosher where I worked. He gave me some good pointers and skooled me. I knew I was up for the challenge when Veggie Wash asked me to think about an organic recipe. They wanted to highlight their organic line of Veggie Wash. It doesn’t make sense to clean organic produce with something that isn’t certified organic, does it? Of course not! So, Beaumont Products, the makers of Veggie Wash , created an organic product. They went above and beyond. They created a product that receives the highest possible certification. Their organic Veggie Wash is 95% certified organic. As you can see, it does a killer job of removing those stickers and residue that the grocery put on the vegetables. Why do they put stickers so many stickers on produce? It seems counter intuitive to me that organic produce has these inorganic stickers on them. Is it just me? So, there was no way I was going to create a recipe that was just a little organic. Oh no! This recipe is 100% organic. The olive oil, the pasta, canned tomatoes for the sauce, cheeses, and vegetables are all 100% organic. So, from here out, I will no longer tell you that it’s organic this or organic that. This recipe is 100% organic. For me, that was a challenge! I don’t buy organic produce. It’s just not in my budget. And I will keep the soapbox under the bed on how I feel about that. Thankfully, there’s a Whole Foods nearby. I spent more time there in the last few weekends than my usual grocery store. Not just because it’s a great grocery store and you can get delicious lunch there. I shop there often because they usually have exactly what I’m looking for. And this time, they did not disappoint. I’ve been playing with the idea of a ratatouille lasagna for a while now. It has been on my list of recipes to make since last year, I think. Since I had tried a vegetable lasagna before, I was hesitant to try another one. However, this one seems to have stuck around in my mind long enough for the perfect time to make it. And this was the perfect time to make it! Now, the only other ratatouille I’ve made was a stir-fry version. I thought it was delicious. However, I’m not sure what my husband thought. It was a #MeatlessMonday recipe when we were eating meatless recipes once a week. I have not made nor have I eaten official ratatouille. I loved the movie though! It did inspire me to put ratatouille on my list of recipes to make. I just took my inspiration in a different route. And look where that route took me! Layers of cheese, pasta, vegetables, more cheese, more pasta, and delicious homemade sauce! Doesn’t that look divine? I’m drooling right now. I want to make another recipe, it was THAT good. Confession. I didn’t get the ricotta at Whole Foods. Somehow, I accidentally grabbed cottage cheese. I hear you, Italians! It’s not the same thing! So, I sent the hubs to Walmart of all places for ricotta. I told him to get whatever he could find. He surprised me with some organic ricotta… FROM WALMART! Who knew? That is why I can say this recipe is 100% organic. Now, if you’re like me and don’t necessarily follow the organic lifestyle, not to worry! 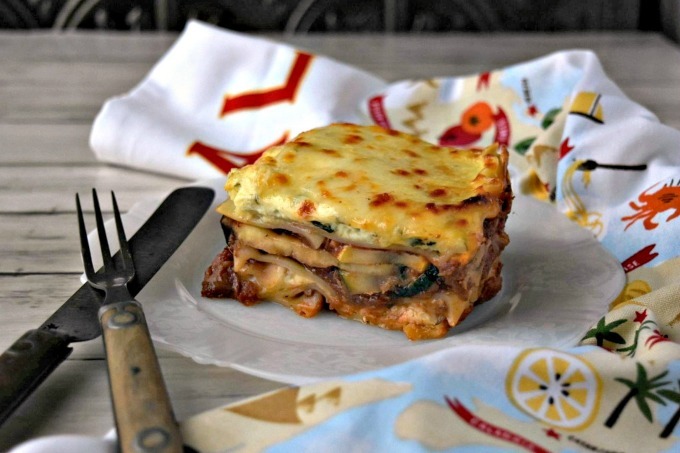 You can still make this amazing lasagna with ingredients that fit your lifestyle. I made my own sauce for this recipe. It’s a simple recipe that makes at least 3 quart jars of sauce. It’s based on an Alton Brown recipe using canned, whole, peeled tomatoes. This sauce is simple, delicious, and tastes just like the jarred version. 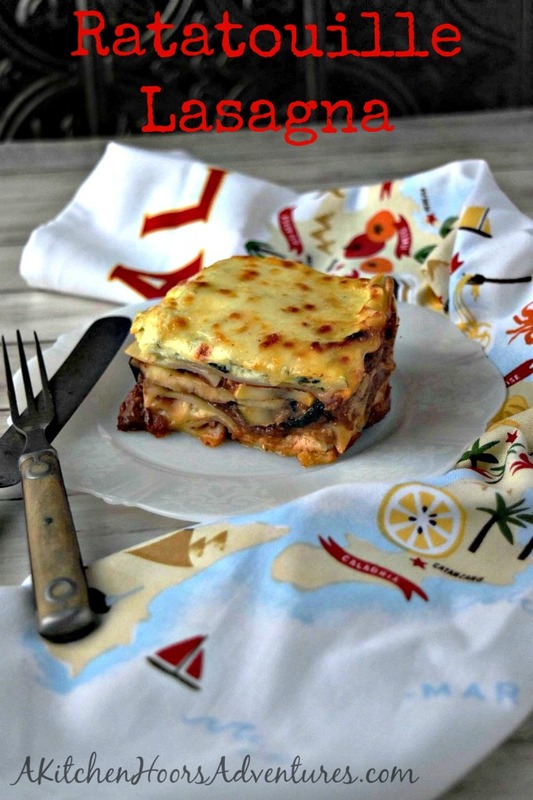 I can’t get over the layers of delicious, organic, goodness that is in this lasagna. And that golden, melted cheese on top? Oh yeah, baby. You can’t resist this recipe. It’s a must make for ANYTHING! Make sure to grab your Veggie Wash for the eggplant, zucchini, and squash. You will want them squeaky clean for this clean eating recipe. Make sure to follow Veggie Wash on Instagram, Twitter, Facebook, and check out their video about their products. Line a baking sheet with parchment or foil. Coat with extra-virgin olive oil. Remove the whole, peeled tomatoes from the can and place on the baking sheet. Sprinkle with 1 tablespoon Italian seasoning and 2 teaspoons garlic powder. Bake at 425 for 15 to 20 minutes or until the liquid in the bottom of the pan evaporates and begins to brown. Remove from heat and cool to room temperature. Heat a Dutch oven over medium-high heat and drizzle with 1 tablespoon extra-virgin olive oil. Sauté the onion until translucent; about 3 to 5 minutes. Add the garlic and sauté an additional 1 to 2 minutes or until the garlic is fragrant. Add the roasted tomatoes squishing with your hands as you add them to the pan. Reduce heat to medium and cook the tomatoes until they begin to caramelize. Stir in the tomato paste and continue to cook until the tomato paste turns a dark red color. Add the red wine and cook 1 minute before stirring in the juices from the canned, whole tomatoes and the crushed tomatoes. Stir in 1 tablespoon fresh oregano, 1 tablespoon fresh basil, and 1 1/2 teaspoons fresh rosemary along with the 2 tablespoons Italian seasoning and remaining granulated garlic. Bring to a boil and then reduce heat to medium-low. Simmer for at least one hour, stirring occasionally, until the sauce has reduced by one fourth. Stir in the Stevia or honey to reduce the tartness of the tomatoes. While the sauce is cooking, slice the eggplant, zucchini, and squash 1/3 inch thick. Line a baking sheet with parchment or foil. Coat with extra-virgin olive oil. 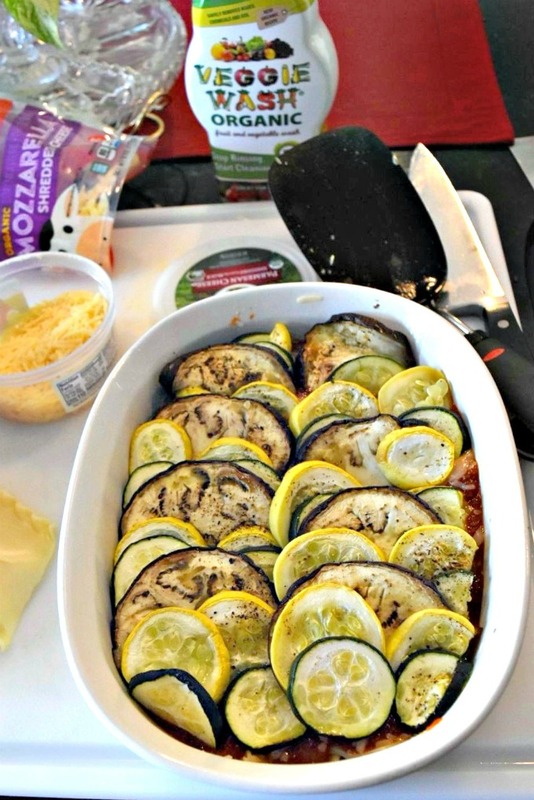 Arrange the vegetables in layers starting with the eggplant, zucchini, and squash and continue until you’ve layered enough vegetables in roughly the same width and length as your casserole dish. Sprinkle with salt and pepper and bake the vegetables at 425 to 10 to 15 minutes or until softened. Remove from heat and set aside. Combine the ricotta with the eggs and the remaining fresh oregano, rosemary, and Italian seasoning. Stir until combined. Coat your casserole dish with extra-virgin olive oil. Place1/2 cup of sauce in the bottom of the casserole dish. Layer with noodles using kitchen shears to cut them to size. Sprinkle with 1/2 cup mozzarella cheese, spread 1/2 of the ricotta mixture, and sprinkle with 1/4 cup Parmesan. Layer with noodles using kitchen shears to cut them to side. Spread 1 cup of tomato sauce on top of the noodles. Cut the roasted vegetables to size and carefully place on top of the sauce. Place another layer of noodles with 1/2 cup mozzarella cheese, the remaining ricotta mixture, and 1/4 cup Parmesan cheese. Top with the remaining noodles, trimming to fit, and then pour another 1/2 cup of sauce on top. Bake, covered, at 350 for 45 minutes. Remove cover, sprinkle with remaining cheese and bake an additional 10 minutes or until the cheese is melted and lightly browned. Remove from the oven and cool at least 10 minutes before slicing and serving with garlic bread. Although this post is sponsored, all opinions are my own. This post contains affiliate links, which means I will received a percentage of sales make through these links which are used to support A Kitchen Hoor’s Adventures. This looks so good. I love veggie lasagna! What a healthy meal! Thank you! It’s so full of flavor, too. Organic or not, this recipe looks delicious! Love the flavors that develop in ratatouille, so I can only imagine they are epic in a lasagna. Thank you! The hubs gave it a thumbs up so you know it had to be good. He’s my biggest critic. I am in love with all of these veggies! Such a great lasagna. Thank you! It is rather packed with veggie goodness. This sounds really good. I am looking to up my veggie intake so this recipe would be a great one to try when I want nothing but veggies for dinner. It looks delicious! Thank you! It really is hearty and delicious. The vegetables make it so tasty that you don’t miss the meat. These looks really tasty. My mom would love these and I will have to make this for her. Thank you! I hope you love it as much as we did. Looks awesome, cannot wait to try it! I’m sure even my husband, who loves meat, will enjoy this, because of all the cheesy goodness in it! YES! That’s what mine said. All that cheese…. nom! Thank you! I’m craving it again. It was so cheesy delicious. You will not miss the meat! I’m here to tell you, if the hubs enjoyed it even devout meat eaters will like it. I hope you enjoy it as much as we did. Looks tasty, and a great way to use up all those in season vegetables. Thank you! Absolutely. Especially those summer squash. This looks delicious and I love that the veggie wash is organic! Thank you! Only makes sense with organic produce to have an organic wash.
Ohh. what a great way to combine the two recipes together. Can’t wait to try it and I spend lots of time at Wholefoods too. We just used one of the jars of sauce tonight with our turkey Italian sausage! It came in handy for a quick dinner. I hope you enjoy it! I love ratatouille and I love lasagna. I can’t believe that you’ve found a way to mix them and it looks so good. I’m making this next week for my dinner! I hope you enjoy it as much as we did. The hubs didn’t even miss the meat! Thank you! I am definitely branching out to other lasagnas. This looks so good! Perfect comfort food that both vegetarians and meat eaters can agree on! Thank you! That’s for sure! The hubs was worried but said he didn’t really miss the meat. Oh Christie, this looks amazing!! So many great things in here that I grow right in my garden. Thanks for sharing this. You’re so very welcome! I am jealous of your garden… And your fresh eggs. I hope you enjoy it!